Have you ever wondered why you can purchase eggs in white or brown varieties? 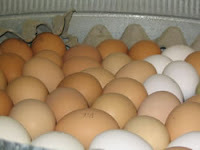 More importantly, did you give any thought to why brown eggs are slightly more expensive than their paler counterparts? The theories are rampant. “White eggs have been dyed,” some people conjure. “Brown eggs are more natural and wholesome,” others explain. Some people equate brown eggs with organic wholesomeness and pick up a dozen instinctively, not even considering taking twelve white ones home. Alas, as in life, preferences based solely on color are short-sighted and based on nothing but assumption. The REAL reason why some eggs are white and others are brown? It all depends on the color of the chicken that hatches them! Simple as that. Nutritionally, they are identical. Fun fact: Araucana chickens — indigenous to northern Chile — have a bluish tint to their feathers and — you guessed it! — lay blue eggs. Martha Stewart actually raises some at her farm in Westport, CT.
What about the price factor, though? Brown eggs are always just a tad bit more expensive than white ones. Puzzling question, simple answer. It all comes down to the simple laws of economics. Brown chickens are larger than their white counterparts, so they require more food. Hence, their eggs sell at a slightly higher price. I raise Ameraucana chickens, cousin to the Araucana. My eggs range in tint from greenish to light teal, even a bit pink from one of The Ladies. My friends and family love it when I give them eggs. Those two breeds of birds are also very tame and sweet–they are great pets. Another myth busted, you don’t have to have roosters to have hens that lay eggs…no crack-o-dawn crowing.